Commentary: Tale of the wartime ’40s, produced by Lyric Unlimited, draws large audiences, points up opera company’s creative vision. The pool of grand opera subscribers may be slowly shrinking nationally, but one can’t help feeling optimistic about Lyric Opera of Chicago’s long-term prospects as the company continues to refine and redefine itself. The Opera’s nimble branch – Lyric Unlimited – attracted two crowds of 1,100 each to the Harris Theater on March 15 and 17 for its latest chamber opera presentation, “An American Dream.” The story follows the plight of an adolescent Japanese-American girl, displaced to an internment camp during World War II, whose postwar fate is intertwined with the couple living in her former home. A loudly enthusiastic audience was the latest evidence of the hard work that Lyric has put into its own expanded vision, much of it at the instigation and encouragement of creative consultant Renée Fleming.The beloved soprano was fêted March 23 at the Lyric Opera House, in gala style, for her 25-year affiliation with the company. 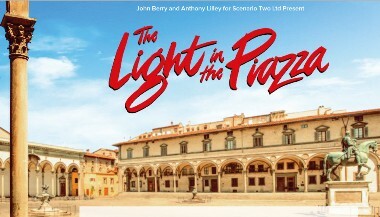 Her involvement at Lyric has included, since 2010, guidance in a host of projects aimed at expanding the company’s relevance and reach, notably the installation of an American musical as a cornerstone of Lyric Opera’s spring..
Renée Fleming, who has helped opera reach new audiences, will star at the Lyric Opera House in a December run of this hit Broadway show. 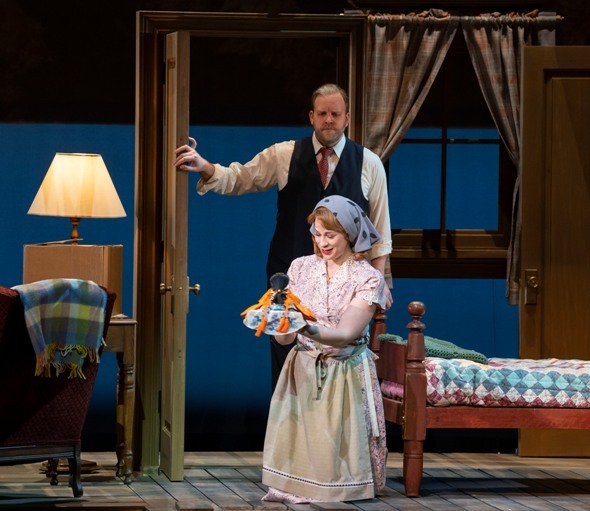 Fleming surely would have been impressed by the performance values on display in “An American Dream” at the Harris, where American composer Jack Perla’s setting of a text by Jessica Murphy Moo conveyed itself, without artifice, in a confident American musical language laced with modern line and color. The opera spans the WWII era from the winter of ’42 to the fall of ’45. It turns out that the lovely home we see onstage was a steal of a deal. 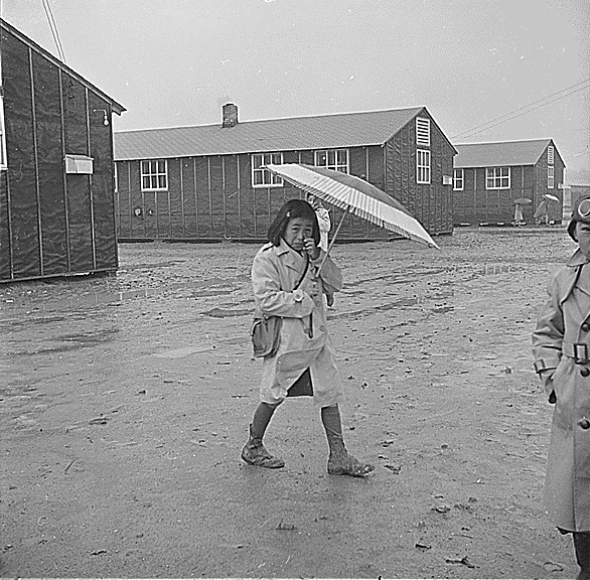 It was sold by the girl’s desperate parents when the family was forcibly interned with 120,000 others of Japanese descent after the bombing of Pearl Harbor. Meanwhile we learn that the American husband who bought the place, a former soldier himself, has a German-born wife whom he met overseas; but she’s German-Jewish, with parents back home in Germany, and their letters have stopped coming. Eva Crowley (mezzo-soprano Catherine Martin) finds a beautiful Japanese doll underneath a floorboard. Her husband Jim (baritone Christopher Magiera) secretly knows why it is there. The resolution of these two intertwined stories is genuinely theatrical, and heartbreaking. Perla’a operas have caught on in the U.S., and audiences that know him stretch well beyond opera in various directions, including jazz and theater. After “An American Dream,” Perla wrote “Shalimar the Clown,” based on the novel by Salman Rushdie, which was given its world premiere at the Opera Theater of St. Louis in 2016, and promptly recorded. Its librettist, Rajiv Joseph, is a playwright very popular in Chicago – his newest play is about basketball star LeBron James, and it will premiere in Steppenwolf’s 2019-20 season, followed by a Los Angeles run. “An American Dream” grew out of a community story-telling project at the Seattle Opera and premiered there in 2015. The Chicago creative team is new, led by Matthew Ozawa, a young American director of Japanese descent, whose own father was born in a Wyoming containment area created by President Roosevelt’s 9066 Executive Order. The design team led by Andrew Boyce (sets) created a look of peaceful simplicity that belied the increasingly unsettled mood building under Slovenian conductor Daniela Candillari’s baton. 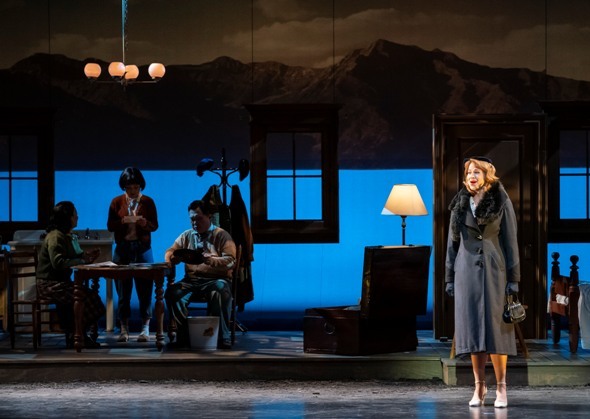 She was back for her second Lyric Unlimited assignment after her solid job with the lavender-scare opera “Fellow Travelers,” and the 15-member orchestra sounded very fine. Setsuko Kobayashi (soprano So Young Park) and the Crowleys exchange painful gifts – a doll from childhood and an undelivered letter from Nazi Germany. Soprano So Young Park starred as Setsuko Kobayashi, the upset girl who hides her beautifully costumed Hinamatsuri doll under the floorboards, then angrily steals a letter addressed to the new owner’s wife, only to return after the war, still angry, to demand impossible answers. 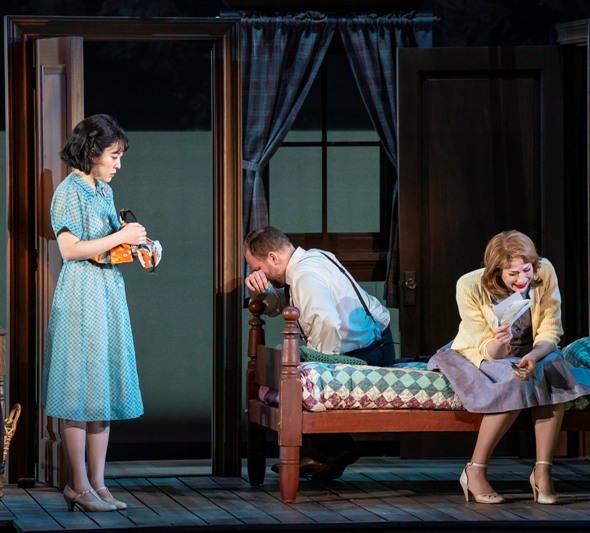 The strong cast included mezzo-soprano Nina Yoshida Nelsen as Setsuko’s mother, who foresees her own tragic fate in a compelling aria of resignation; bass-baritone Ao Li as Setsuko’s disciplined and restrained father, who does what he must; baritone Christopher Magiera as the opportunistic veteran Jim Crowley, and mezzo-soprano Catherine Martin as Eva, Jim’s increasingly worried wife. Thus a new generation of creative artists, interested in exploring new operatic themes, is making its way. Traditional grand opera is hanging on fairly well in the U.S., yet if one draws the circle larger it’s clear that lyric theater, more freely defined, is expanding. Chicago has without question a theatrically sophisticated, jazz-savvy, and dance-loving audience in addition to one famous for its devotion to classical music and opera. 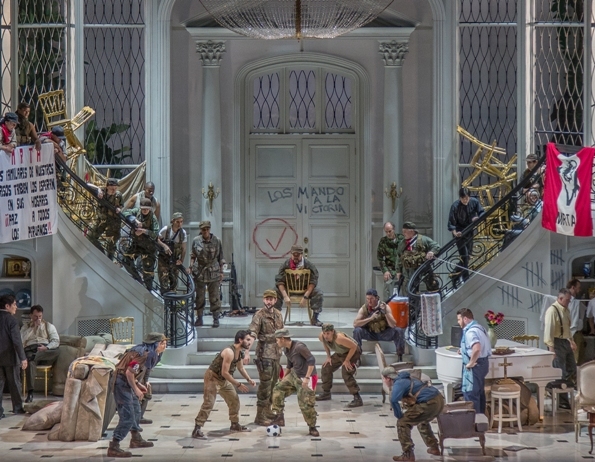 It’s hard to argue that Lyric Opera isn’t onto something by becoming more inclusive of the works it performs and the way in which it presents them. The city’s leading theater directors have taken their turns directing at the Lyric, among them Chicago Shakespeare’s Barbara Gaines and Goodman Theatre’s Robert Falls, who were articulate in their enthusiasms about their particular operas, (videos here and here ) and have large and loyal followings of their own. The Joffrey Ballet moves its performances to Lyric Opera House in the fall of 2020, which will undoubtedly lead to more audience cross-pollination. And it seemed fitting that “An American Dream” was given in the week that Fleming was celebrated across town at the Lyric Opera House. If her reign as leading lady included traditional roles such as Verdi’s Desdemona and Violetta, Mozart and Strauss Countesses, Massenet’s Thaïs, and Lehár’s Merry Widow, let it also be remembered that Fleming starred as harried, unstable Blanche in André Previn’s treatment of “A Streetcar Named Desire.” And that she fostered a comedic partnership between Lyric and Second City. And that she curated the contemporary grand opera “Bel Canto,” based on Ann Patchett’s recent novel about an attack by Peruvian terrorists on a Japanese embassy; where a famous diva is held hostage. Fleming’s inauguration of her American Musical Theater Initiative has been unarguably transformative, bringing large audiences for new productions of Rodgers and Hammerstein favorites and other classics. And Cayenne Harris, the company’s vice president in charge of Lyric Unlimited, sees that enterprising venture of the company as an incubator of new work through commissions and co-productions that can be developed on a fairly short timeline. 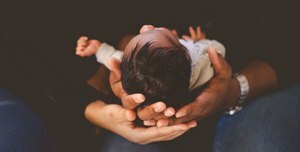 Next season comes “Blue,” by composer Jeanine Tesori and librettist Tazewell Thompson, about the contemporary tragedy facing a young black couple trying to raise a son. By the time Chicago gets it, after a first run this summer at the Glimmerglass Festival in New York followed by early 2020 performances in Washington, D.C., the show will be in its third iteration, with a different conductor and possible cast changes, plus a new location for a Lyric Opera event – Chicago Shakespeare Theater at Navy Pier. 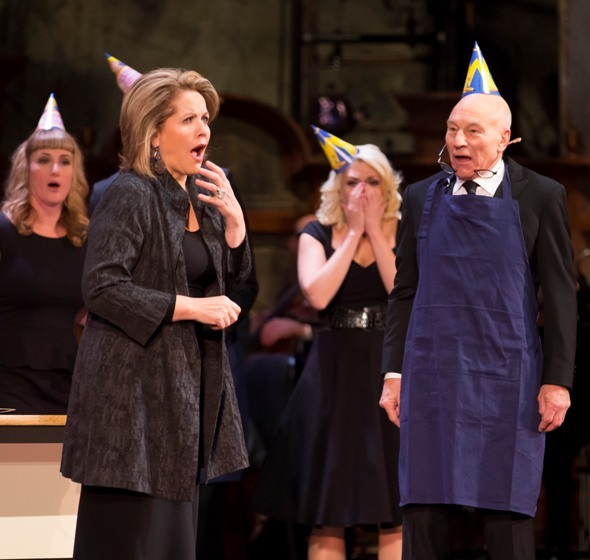 An opera-singing co-worker ruins the retirement party of her boss (Patrick Stewart). Second City comedians teamed up with Fleming for a friendly 2013 send-up.